Oh, cardio. Does anyone really love it? The first ten minutes are usually pretty miserable for me, but then I tend to find my groove and get in the zone. The one thing that can make or break my workout? Having my headphones, as I've found that a great playlist makes the cardio time fly by. Another trick for making the time fly by? Sprints. I'll usually do a 2-3 minute warm up jog, then do 20 second sprints and 40 seconds rest for 8-10 minutes, then a 2-3 minute slow jog, then repeat until 30 minutes has gone by. It's a great way to work up a good sweat. Here's what's currently on my playlist. If you're on spotify, I'm @yogabycandace, if you want to try to find me (I find spotify to be so difficult to use for finding people). 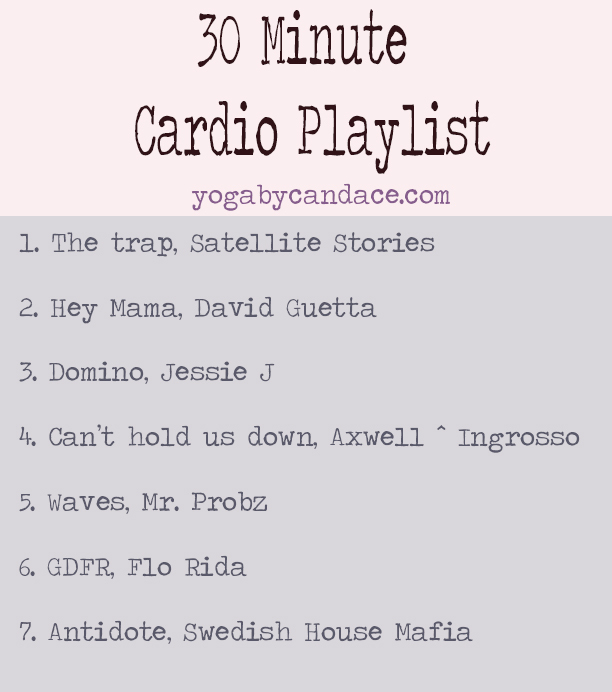 Let's talk I'd love to hear what's on your playlist for cardio! Also, do you have any tricks for making time fly by for cardio?